I’ve been hanging out with a bunch of single women recently. It’s okay, you can tell my wife -- they’re nuns. A number of the Sisters of St. Margaret have been attending services at St. John’s the past few months and they recently invited me down to visit their convent on the South Shore. This may come as a surprise on several fronts. First, there are indeed Episcopal nuns -- Roman Catholics don’t have a monopoly on religious orders. In fact there are many Episcopal monasteries and convents throughout this country and the world. They don’t fit the Nun-zilla image portrayed in movies such as Sister Act or the Blues Brothers and I’ve yet to see one of them sneak a ruler into church. The second thing that may surprise you is that their convent is located on a large parcel of waterfront property in Duxbury. Any developer would surely drool over their location, imagining several mansions and lots of money exchanging hands. Don’t get your hopes up -- they’ve owned the property since 1903. 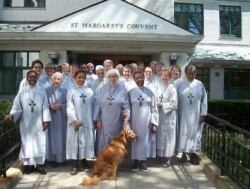 If you’re interested in finding out more about the sisters, check out their website at ssmbos.com (yes, modern nuns have websites). I encourage you to contact them for a visit to the convent or even to donate money to support their ministries -- all of which you can do via their web page. I guarantee your life will be transformed by the encounter. Just when I think I've pretty well figured you out you veer off into a totally new and quite different space. So....keep it up and challenge the rest of us to venture out into ne and uncharted territories. St. John's gain is the loss of several Boston churches, as the Sisters used to visit and help in and around the city before their convent and property in Roxbury was sold. Several of the sisters would travel by T to Grace Church, Everett when we were reaching out to the many Haitian folks in our city. Getting to know them was a privilege. So lovely! I pray our church doesn't take against our women religious as the church of Rome seems to have done. Most unlikely.